In Francesco Cangiullo’s one act-play Detonation (1915), the curtain rises to reveal a deserted road at night. A shot rings out. The curtain falls. Another play of his from the same year, called Decision, is fifty-eight acts long but the stage instructions indicate that the first fifty-seven are redundant. The fifty-eighth consists of a single line: ‘This thing must come to an end forthwith’. The curtain falls. These may be the closest precursors to Achille Campanile’s ‘two-line tragedies’, many of which were clearly not meant – or downright impossible – to perform (although in recent years some have tried). Like in that other Cangiullo play, There’s no-one about, whose only character is listed as ‘A man who isn’t there’, to which Campanile responded, decades before Beckett, with his ‘Non-Existent Tragedy’. The scene takes place nowhere. Eva, l’ava, leva la lava, lava l’avo e alleva l’Iva con l’ova e l’uva. Most, like the above, are at the service of lamentably untranslatable jokes, as in the masterpiece ‘Drama at the haberdasher's’, or ‘Si conoscevano appena e già si davano del tulle’(‘they barely knew each other yet they already exchanged tulle’). Others could be translated but haven’t aged so well. There are more cheating-wife scenarios than a contemporary audience might tolerate. In a bedroom, in the present day. arriving suddenly, finds THE WIFE in bed with a stranger: Ah, traitor, the anonymous letter I received an hour ago was telling the truth: you have a lover! So what, you believe anonymous letters now? Come on! The balance, however, are well worth sharing. Like this one. As the curtain rises, TIME, YOUTH, LOVE and LIFE are playing contract bridge. The cards have been dealt. 'A Bad Hand' was quite popular between the two wars and Campanile found that it had been plagiarised, along with others, by newspapers in South America and elsewhere – a rather impressive discovery to make before the internet. The mode in which these proto-tweets were disseminated could in fact be an interesting subject of study in itself. I say proto-tweets also because some of them are very reminiscent (in reverse) of some of the current fashions for comedy. ‘Overheard’, for instance, nowadays has its own sub-genre on social media. When the curtain rises, SOMEBODY has said something which SOMEBODY ELSE approves of, albeit with some reservations. While some tragedies are positively garylarsonesque. Dad, when I’m big, will you buy me a watch? Silly, you’ll never be big. Rushing cheerfully towards the flypaper crowded with flies, having misread the situation: Is there room for me? Lands. while toileting, talking to THE ASTRONOMER GIOVANNI SCHIAPARELLI who is looking through a telescope: Giovanni, have you seen my rings? Campanile had a solid line in deadpan humour. The scene is two men talking. Did you pay a special price? No, I saw it in a shop and I bought it. In what way was it a bargain then? Now that you mention it, it wasn’t a bargain as such. referring to a shop-keeper: That swindler! There was this hat in his window. It was marked 35 liras. I asked for it. I said: ‘That hat over there. The one in the window.’ He gave it to me. I paid with a hundred-lira note. He gave me 65 liras change. How was it a swindle then? Now that you mention it, it wasn’t a swindle as such. But you can never be too careful. Nor was he afraid to restage the classics. Outside the fortified walls of Thebes. The great bronze doors are shut. Behind, on the ramparts, the SENTINEL walks back and forth. The MESSENGER, having just arrived, knocks on the doors. Back to the meta-horseplay of the futurists, and especially reminiscent of Marinetti’s Le basi (‘the foundations’), a play whose staging instruction was that the curtain should only be raised enough to show the performers’ feet, is ‘Tragedy during the staging of a comedy’. THE OTHER ACTORS AND ACTRESS OF THE COMPANY, EXTRAS, STAGE-HANDS, ELECTRICIANS, THE CARETAKER, FIREMEN, PROPMEN, ETC. The scene is the stage of a theatre during the performance of a comedy in three acts. The actors and actresses act, come, go, move in perfect synchrony, until finally, near the conclusion of the final act, the FIRST ACTOR suddenly halts his brilliant performance , grabs his wig with both hands and looks around in shock. The action stops. All the actors abandon their parts and crowd around THE LEAD ACTOR, who looks utterly depressed. speaking to the LEAD ACTOR, with dismay: What’s happening, for heaven’s sake? We reached the end of the third act, and we forgot to raise the curtain! There are many more examples of this carry-on. 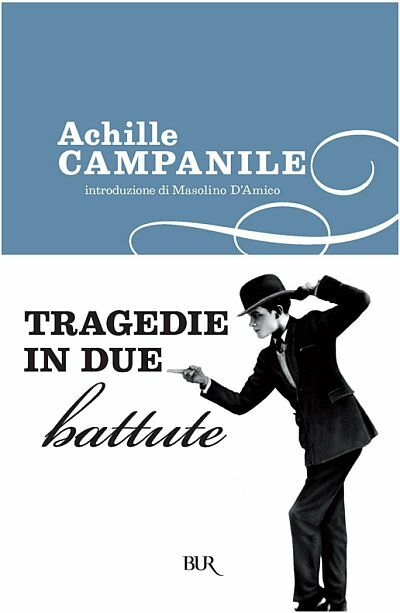 Linking the futurists and Pirandello with the likes of Ionesco, Beckett and Pinter, Campanile found absurdity in theatre itself and its conventions, therefore in the set-up for his own jokes. The scene is a deserted town square; in the background, an arch surmounted by a brightly lit clock; to the right, a café with some tables outside, and the pharmacy; to the left, a barber’s, an inn with a sign depicting a rooster, and Francesco’s house. Enters stage left and rings the bell of Francesco’s house. Seeing as nobody opens the door, he rings again several times; he beats on the door with his knuckles, then with his fists, finally with his walking stick; he kicks the door, but gets no reply; CARLO understands that Francesco is not home and exits, leaving the stage empty. The two-line tragedy cannot take place. Therefore, among the clamour of the audience, the curtain falls rapidly. Coming home with a large parcel I brought the gas masks. Great. Tonight we can go to sleep with the gas on. Or this existential, definitive number, which offers an appropriate close. The scene takes place right after the world has been created. Shucks! Everyone’s been created except me. Achille Campanile. Tragedie in due battute. Milan: Rizzoli, 1978. The excerpts in this post are translated by me. The new issue of SPORT is out this week and my essay on Elena Ferrante and badly written men is online (as is this great story by Pip Adam) but you should buy the print edition anyway. Sounds very much like the Green Goose Theatre of Konstanty Ildefons Gałczyński (who got his degree in English classics at Warsaw University with a dissertation on a poet he made up for the occasion). Oh thank you friend. I'm always on the look out for more of these, I'll try to source it somehow. Are you familiar with Karl Valentin's work? It's also in that general area. I'm sure I've got some Gałczyński in print; I'll try and dig them out. Aggiungerei poi Ringelnatz, forse il mio preferito. What colour is your nationalism?